United Methodist Volunteers in Mission : About Us : What is UMVIM? Even though United Methodist Volunteers in Mission [UMVIM] is the “official” short-term mission agency of the United Methodist Church, many churches and individuals we work with often have questions about the function of UMVIM. What is an UMVIM volunteer/team? 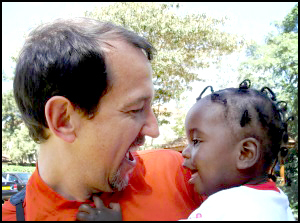 Most consider an “UMVIM team” to be a volunteer team of United Methodists that go to serve out-of-state or abroad for a short period of time. However, an “UMVIM team” is so much more than that. If you are an United Methodist and you are engaged in outreach as a member of an United Methodist Church, then you are an UMVIM volunteer. Often, we don’t get to hear the stories of many UMVIM teams, so please share your mission experience. If you are reaching out in service as an expression of your faith and your membership vows to your local United Methodist Church, YOU are UMVIM. What does the UMVIM, SEJ office do? Each geographical jurisdiction of the United Methodist Church has an United Methodist Volunteers in Mission Jurisdictional coordinator and/or office. Since we represent the Southeast Jurisdiction [SEJ], our job is to help connect and engage United Methodists throughout the Southeast in mission service. Since there are over 2.7 million professing UMC members in the Southeast alone, this is a big job. Much of our work consists of training individuals to lead domestic or international mission teams, as well as serving as a hub of information about mission opportunities all over the world to better resource UMC volunteers. In short: we want to help you move from the pew of your local church out into the world to serve while ensuring that you are equipped with the necessary tools to show Christian Love in Action. 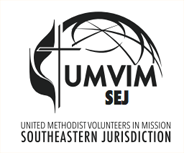 Why does UMVIM SEJ need monetary donations? We do all this work without the help of local church apportionment funds, or any guaranteed funding from the UMC denomination or other agencies. We rely heavily on donations from local churches, individuals, and Annual Conferences to ensure that we are providing mission teams with the best resources in order to make their trip a success, help teams identify and select projects, and to help volunteer mission teams out the doors of their local church and into the world to serve with different communities all over the world.